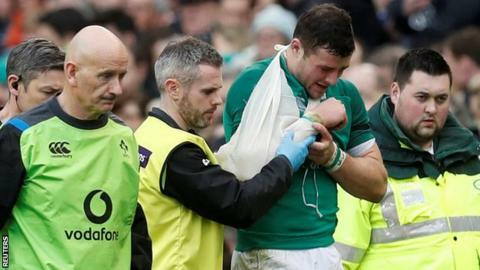 Rugby chiefs have announced an eight-point plan to make the game safer after their annual injury audit found a rise in the number and severity of injuries in the English professional game. For a sixth straight season, concussion is the most reported match injury. There has also been a spike in training ground injuries and injuries picked up on artificial surfaces. Premiership Rugby says the report has revealed "significant challenges" for player welfare. One new measure is to work with World Rugby on reviewing the laws, with the current permissible height of the tackle under consideration. Further analysis will also be done to assess training sessions. The Rugby Football Union (RFU), Premiership Rugby (PRL) and the Rugby Players' Association (RPA) findings showed that training injuries rose during the 2016-17 season, having fallen in the two previous campaigns. In total, 36% of all injuries were sustained during training sessions. The data covering last season also found that the average injury lay-off was 32 days and that concussion accounted for almost one in four - or 22% - of all injuries. As part of the new action plan, the group also wants to determine whether increased tackle sanctions brought in by World Rugby from 1 January 2017 are being consistently applied. This is the 14th report of its kind - and by far the most concerning - with Premiership Rugby admitting it represents "significant challenges" for player welfare. The data backs up the feeling that rugby union is at a tipping point when it comes to injury and safety in the professional game, while the questions over artificial pitches are embarrassing for the RFU, given how much money has been invested into those surfaces. The powers-that-be need to act, and have launched a wide-ranging plan to try and make the game safer. Former England international Nigel Melville, the RFU's director of professional rugby, said: "We want to work with the players, the professional clubs and World Rugby to build a much better body of knowledge about this, so we make better, more informed decisions." Premiership Rugby's Phil Winstanley added: "Player welfare has to be, and will remain, at the centre of everything Premiership Rugby do as an organisation, and working with the RFU and RPA we have identified immediate actions which we have to take in addition to the work that we are already doing in this area. "It is clear though that this is not just a Premiership issue: this is also a world game issue and we look forward to engaging with World Rugby to identify solutions which benefit all."